The Camera Bits Black Friday Sale! | Camera Bits, Inc. The Camera Bits Black Friday Sale! You’ve been asking about it, and it’s finally happening! The Camera Bits Black Friday Sale starts November 23! 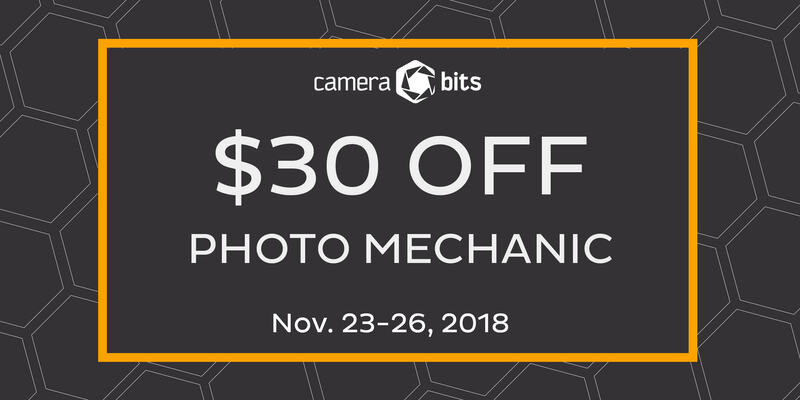 We are excited to offer a discount of $30 off a new Photo Mechanic license, and $15 off an upgraded license. This sale is valid worldwide, starting at 12:01 A.M. (U.S. Pacific Time) on November 23. At midnight (U.S. Pacific time) on November 26, the sale will end. Discount pricing for both a Photo Mechanic license and an upgraded license will be automatically added to your cart upon purchase in our online store. There is no promotion code to add during checkout. To stay up to date on future announcements, subscribe to our newsletter and follow us on social media! The retail cost of Photo Mechanic Version 5 will be reduced to $120 USD for a new license, and $75 for an upgraded license (eligibility required) starting November 23rd, 2018, at 12:01am Pacific Time, and ending November 26th, 2018, at 11:59pm Pacific Time. This is a limited time offer. Promotions, discounts, and other promotional codes can not be combined. If any of the products related to this offer are returned, your refund will equal the amount you paid for the product, subject to applicable refund policies.